Welcome to La Cuina de Sant Telmo. 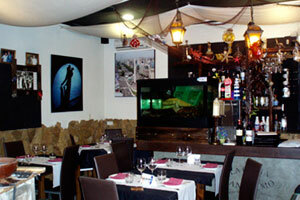 Our restaurant was founded in 2009 by Marcelo Jorge Rodriguez Mir. Born in Buenos Aires (Argentina), the most European city in South America, Marcelo was raised in the most picturesque and interesting city where today still retains the spirit of Buenos Aires tango and folk architecture. The culinary tradition comes from his childhood, as his father, a Galician who emigrated to Argentina, worked there as a banker, and combined his career with his restaurant in Buenos Aires also with her Catalan wife, Susana Mir. 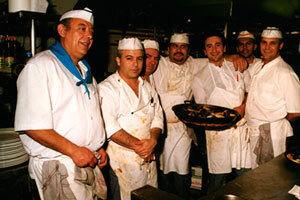 Marcelo grew among his father's business' hotplates where he acquired his culinary knowledge and wisdom. As an adult he wanted to return to their parents land. He worked at several prestigious restaurants in Spain before opening his own, and he got specialized in fresh fish, seafood and meat imports. 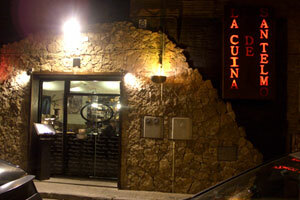 He thought about opening his restaurant in a special and charming place, so La Cuina de San Telmo is located in the heart of Sant Cugat del Vallès (Barcelona) between narrow cobbled streets, located at Industra 27, few meters from the Monastery of the city landmark. In La Cuina de San Telmo we offer mainly seafood personally selected by Marcelo in the market from Barcelona, ​​Rias Baixas and Ribeira Aguiño (Galicia). We specialize in pica-pica of excellent fried (fish, squid, squid ...), the mixed roast fish (monkfish, sole, cuttlefish, shrimp, clams ...), the special seafood (prawns, langoustines, razor-shells , mussels...), Palamos prawns, anchovies from L'Escala, arcade oysters and any fresh fish: sole, turbot, crayfish, monkfish, hake, prawns, and so on. If you prefer meat, we offer our great San Telmo grill with specially selected products from Galicia and Argentina. We also recommend our San Telmo steak and the delicious Burgos baked pork among others. Come and visit us, this will be the best way to get to know us.